Hello everyone, glad to be back! I had to push back my blogging schedule for some personal reasons, so that's why I missed all of last week. I hate taking blogging breaks, but sometimes it's just necessary when life throws you a curveball. Anyhow, it feels like it's been forever since I've done an outfit post, so I wanted to share one with you today! I'm going to try and add more outfit posts on the blog and I would love to know what types of looks you would like to see (be sure to tell me in the comments!). Since I've graduated I definitely feel the need to start adding some more versatile pieces to my wardrobe. For me that means something that can possibly double as business casual wear. Although I'm not currently looking for a job (that will start in September!) I do want to start building up a more professional wardrobe! 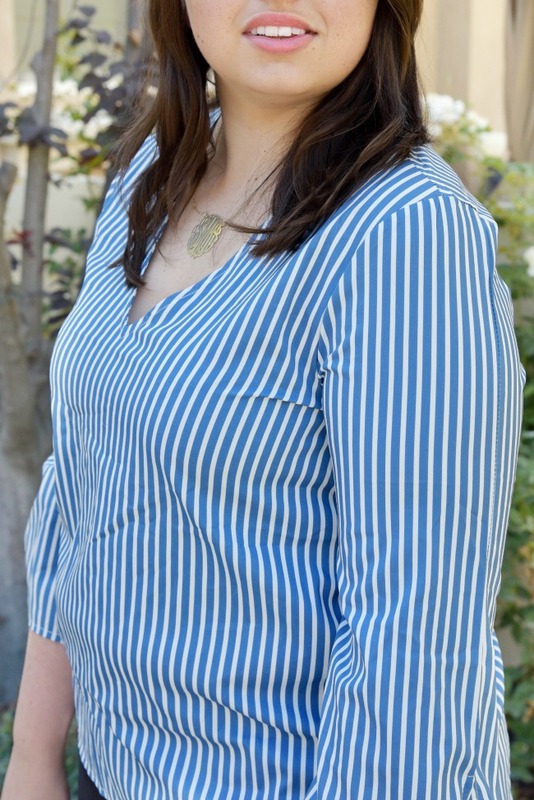 I love this v neck striped top from Romwe because it is perfect for work, but can still be worn as just a cute top. The little tie details on the sleeves are too cute and are perfect for the summer! The material on this top does make you feel a little warm, so I'll probably be wearing it on cooler days. I paired it with a pair of distressed black jeans that I recently bought and have fallen in love with. I've been on the hunt for a good pair of distressed jeans for a while now and came across these ones at Old Navy and bought them in both black and white. They're so perfect because they're both comfortable and flattering, both necessities when purchasing jeans! I'm also still obsessing over these platform espadrille dupes that I found a while ago. They're so comfy and instantly upgrade any outfit! I honestly can't believe that they're only $60, the next pair on my list is the cognac ones! What are your favorite ways to add more work appropriate pieces to your closet? the internet would be a much better place. Please keep it up!.. Love your style girlfriend. Thanks for sharing these fashion tips! I really like how you paired this striped top with distressed denim-- such a great look for summer AND affordable. Love a great stripe and this top is adorable! Such cute little ties on this top. Love it paired with black! GF, you can never go wrong with stripes! Great top! What a gorg top! Love the stripes!! 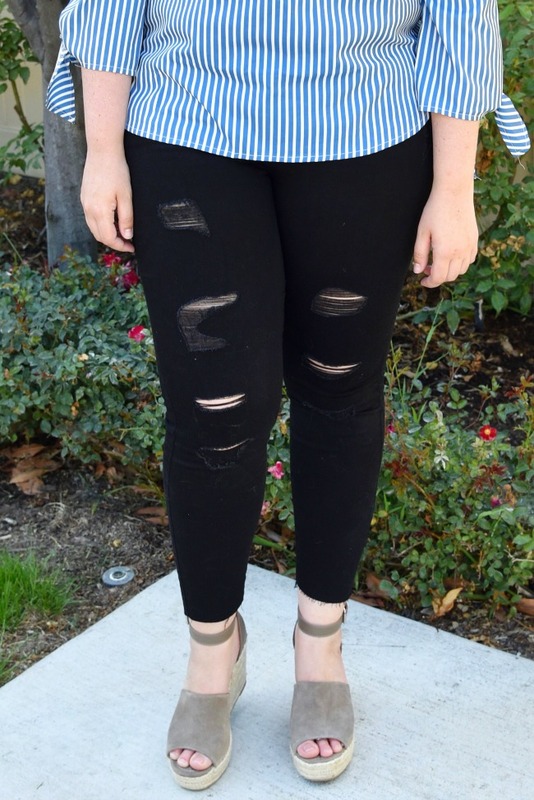 Love this striped shirt with the black jeans and espadrilles! I recently graduated as well so I'm all about looking for clothes that can be worn for work and personal settings. This look is great! This is a great post- I love the ripped jeans with that top! I feel like a striped blue top is such a staple for summer! I love that you could wear this in so many different settings. And I love those ripped jeans! Stripes are so in right now! I love that top. Blue and white stripes are such a darling trend for summer time! That is the cutest outfit. Love the pants! I'm so with you - I love any piece of clothing that I can bring from day to night super easily. This is a great top. I've been loving stripes lately. That top is so cute!! you are such a stunner!!!! Love the striped top! So fun for summer. I love that top!! I love shopping at Loft for clothes that are both work appropriate and fun! What a great top. Looks great with the jeans! I love this entire look!!! I love this look! Would be so cute for fouth of July! I LOVE how you styled this top! I'm right there with you on loving versatile pieces. I'm much more likely to invest in a piece that takes me from work to weekend. Seriously about to order those shoes! Love this top! I really like how it can be paired with distressed jeans for a causal look, or dressed up for work! I love the cute little ties on the sleeve! This top is SO adorable on you. Darling!! Totally in love with button up striped blouses! This top is adorable! It looks so comfortable and light for a summertime top with longer sleeves. What a cute top! I'm all about blue and white tops! You look super cute! Love your top! You are so cute in your summer stripes! Perfect top for the July 4 festivities! So cute girl! I love anything and everything striped!! I'm a sucker for stripes and I love this one! Love the cute sleeves! you look absolutely stunning girl! Aw love this pretty top, babe! Perfect for summer! I love blue & white stripes! So perfect for summer! such a classic stripe print! This top is so pretty! Love it with the ripped jeans! I am all about stripes these days!! Beautiful outfit! I love the top with the distressed jeans! Such a cute top and the ripped jeans are perfect with it! I love how you styled the more classic top with the ripped jeans! PERFECT COMBO! Cute top babe! Perfect for summer! 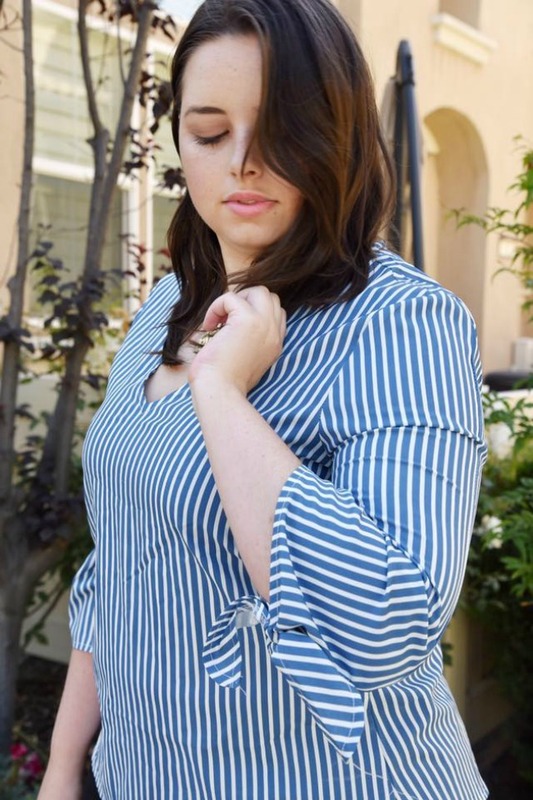 OK I'm s sucker for stripes, so this top is right up my alley!! Love this look! This top is so cute on you! Love your style! Cute, classic outfit-- stripes are always the best! This top is so cute, I love it with the black denim!